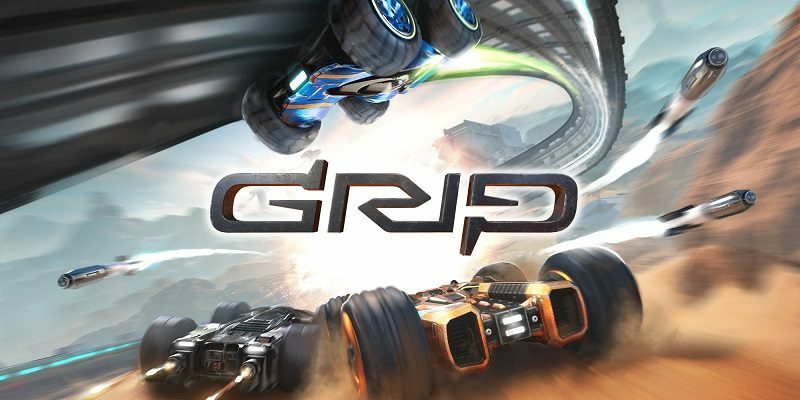 , and March 28th 2019 in JapanOn this page, you will find all there is to know about the Software updates for GRIP on Nintendo Switch (originally released on November 6th 2018, in Europe and North America). Spin Cycle (Liddo5) (Forest): Key sections include an open area with nice autumn visuals, tunnel turns perfect for barrel rolls, glass tunnels and an obstacle ridden turn to the finish! The level cap has also been increased to 40, with unlocks of paint jobs and new tires for cars. In addition to this Pariah now have coloured paint that can be customized! Voting has been tightened up and acts similar to the PC version. All players can vote. The game will take into account all votes and create a config. A timer has been added to the online lobby that automatically starts the game if players are dormant. Spectators leaving MP games are no longer reported in the HUD feed. Split-screen tournaments now work beyond the first event. Split-screen results for players are now always displayed correctly. Bug fix that allows 2nd, 3rd and 4th split-screen players to access and customize their vehicles within the garage. Difficulty level and engine power now can’t be voted upon in MP games. Bug fix for allocating the correct vehicles to players in split-screen. Bug fix to disable players from joining tournaments once they have started, regardless of whether they know the private game name or not. Maximum game time and maximum kill count now averaged in votes for MP games. Fixed bug where not all players would have a player controller created for them inside a garage after exiting a race in split-screen mode. Bug fix for MP game auto-start sometimes not kicking in. Bug fix for MP game auto-start not aborting on the client when appropriate. Bug fix for the rendering of “Press X To Join” on split-screen join panel – so that it will fit vertically rather than horizontally which helps localisation. Bug fix for selecting the correct pickup table when there are fewer than 3 players left in an event. Bug fix for AI bot catch-up in MP games. A big one for the community. Originally, we envisioned how it was set up as something combat racers would want, to keep the fighting close but players found it too aggressive and leads could be wiped out through no ill move by the player. So catch-up assistance is now less aggressive and, importantly, off by default when playing Campaign. AI bots now often avoid static obstacles more smoothly than before and AI bots now drive more competitively, but not unfairly, when catch-up assistance is turned off to make sure we keep the race aggressive and entertaining. Bots now adjust cornering speeds dynamically depending on how much grip they have. Bot vehicles of the same maximum speed range are now matched against humans where possible. Hit points for all vehicles are now 100 in arena and 150 in race modes, this reduces the chance of 100% damage during a race but increasing it during deathmatches. Vehicle audio improvements have been made, increasing the volume of some sounds that were too quiet and improving sounds which acted incorrectly. Bug fix for vehicle physics movement and velocity prediction calculations. Reducing the chance of vehicles losing control unexpectedly and making it easier to control them in air and on the ground. Fixed bug in the garage where the vehicle name, logo and stats wouldn’t update when loading a saved preset. Bug fix for vehicle catch-up state change being so slow, causing ‘Rubber-Banding’ to appear unfair and unpredictable. Bug fix for no more rumble on controllers for destroyed vehicles. Bug fix for unwanted decals now removed from vehicles a player has selected which subsequently became unavailable. Various bug fixes ensuring all achievements are now attainable. Bug fixes for the “I did it my way” achievement, preventing the achievement from unlocking when it shouldn’t. Bug fix for illegitimately attaining achievements when spectating a MP game. Bug fix for “Stunt Double” achievement being more accurately achieved, this increases the chance of unlocking the achievement if the user correctly completes the action required. Crash bug fix for writing leaderboards. Numerous text clipping issues have been removed. Cleaned-up display of leaderboard entries. Arena kills/death ratio now recorded correctly. Best lap-times and best Carkour times are now recorded in thousandths of a second to match the way they’re displayed in the game. Audio played for when leaderboard queries fail. Polish language has been overhauled. Hungarian language has been overhauled. Japanese language has been overhauled. Local players now highlighted on the leaderboards. Best lap times no longer recorded on leaderboards if they were achieved with catch-up assistance. Bug fix to avoid storing 0 values on leaderboards. Bug fixes to prevent bad data from entering the leaderboards. Bug fixes for reporting position in events during a tournament. Tidied up the rendering of the leaderboard panel. Increased the number of rows on the leaderboard from 12 to 25. Bug fix for showing the correct rivals on scoreboards as they relate to the rivals shown in the related game event. Bug fix for capitalisation of foreign strings. Bug fix to stop glitching audio. Bug fix for showing the correct event placement between events during a tournament within a campaign. Bug fix for the handling of apostrophes in capitalising text. Crash bug fix for saving player progress state in split-screen. Bug fix for UI panel looping on B for back after going into the garage on split-screen. Bug fix for smoothing out obstacle avoidance. Bug fix for post-event screen player information related to animation, display of XP and level for a player once they hit the maximum. Bug fix for managing rivals between different tiers going backwards and forwards. A rival is always given no matter what the situation when called for. Bug fix for avoiding offering rivals that have already been destroyed in campaign mode. Bug fix for duplicate or empty player IDs for vehicles in split-screen which at the very least now links game results to players effectively. Bug fix for determining the active rivals for a player within an event. Bug fix for the ongoing management of rivals ensuring that the rivals given during the campaign are accurate and consistent. Bug fix for the registration of attacks of rivals against a player. Bug fix for the post-event XP level animation to take into account maximum level. Bug fix for the main player stats to take into account maximum level clamping. Events now duplicated from the last event when adding a new one in a custom tournament. Bug fixes for detecting the final boss battle, the game will recognise when the final boss battle is available and when it has been completed. Bug fix for the Spectre automatically being given out at level 30. Bug fix for boss battles where slow-mo camera is now switched off at the moment a race starts and when a game ends to try to prevent issues encountered by some players. Bug fix for the number of laps being capped at 128. Bug fix for playing prev/next music tracks to avoid playing tracks the player has deselected. Significant menu map performance increase through making the on-screen player stats at the bottom of the screen static rather than dynamically updated. Optional instantaneous look back / side inputs from the player, rather than them being smoothly transitioned. “Denied” sound now played whenever you try to do something that isn’t possible, like reset when a missile is locked on you. New anonymous avatar for players we cannot identify through the online subsystem. Almost all the maps have been optimised to improve overall performance. Resized all AI character icons to 1024 and set them all the sharpened so we can see them more clearly in the UI. Event progress bar now calculated more accurately at the end of the game when the countdown begins in network games. Fixed the Best Damage Received stat at the end of a race. Added support for binding the right thumb-stick in the settings menu. Binding any direction on the right thumbstick will remove the axis look around mechanics. Stripped tier, tournament and event qualifiers from rivals. A reworking of the rivals admission and discharge to make it more controllable. Removal of duplicates from many player progress lists such as unlocked vehicles, levels played etc. Defence turrets now inactive when playing a duel in the campaign. The avatar system is now more robust. People’s avatars and tags appear correctly, no duplicates occur. Bug fix for “YOU PLACED N/A” appearing in split-screen tournaments by not showing this panel at all. Flags have been added to the start/finish line. The main menu has now been updated so that it includes PC improvements. Many mods to ensure the boss battle is detected more accurately no matter what happens to the campaign configuration in the future. Characters driving the Spectre vehicle now shown after campaign completion in SP events. Bug fix to apply default colour schemes to new vehicles. Electrical sounds volume is now set correctly. The Tempest vehicle now has improved suspension properties to make it easier to handle. Bug fixes for vehicle customisation. Animation of the post-event screen now accounts for level capping at level 30 so as to avoid confusing the player. Carkour events now always restart with a ‘3, 2, 1, GO’ introduction so the player can gauge their launch boost. Arena “View to a kill” is now rebalanced and redesigned to flow better and be more fun. Arena “Magmatic core” now has speed pads to get around and a platform to prevent insta-death in the middle lava. Bug fix for the countdown on Carkour maps. Bug fix for restarting the game timer correctly when restarting a Carkour event. Bug fix for arena total kills overwriting the arena kill ratio in the leaderboards. Various tracks have had collision improvements, performance improvements and other small fixes. There was a lot of feedback around weapons and we’ve spent a long time trying to perfect the balance. Improvements to missile targeting when the target is manoeuvring hard should see a more fair hit chance and based on feedback, we’ve also improvements the missile movement to have them avoid the floor much more often when launching. You’ll still need to time it right, but it’s much fairer now. Bug fix for vehicle physics when the Disruptor pickup is in use. Increased effectiveness of the Raptor. Improved the Hydra movements to help them hit their target more often. Defence turrets now inactive on the easy difficulty level. Bug fix for rendering when the Disruptor is active. Bug fix to ignore collisions between Assassins and vehicles other than the target vehicle if the speed difference is high enough. Bug fix for the rendering of pickup icons when double damage is in effect. Bug fix for restoring shield post-EMP. Improvements to missile movement handling to have them avoid the floor much more often when launched. Bug fix for human-controlled Raptor not targeting off-angle vehicles. Bug fix for missiles exploding against the launch vehicle. How to download updates for GRIP for the Nintendo Switch?